An unprecedented number of people is currently on the move seeking refuge in Europe. Large parts of European societies respond with anxiety and mistrust to the influx of people. Nationalist, anti-migrant parties from Slovakia over Germany to the UK have gained increasing support among the electorate and challenge the political mainstream. Europe is struggling how to respond. While the search for solutions is ongoing one pattern seems to be emerging: Fortress Europe is in the making. Unfortunately, few of these discussions and measures consider the structural root causes and dynamics of migration, the motives of migrants or societal challenges more thoroughly. This book seeks to address this deficit. 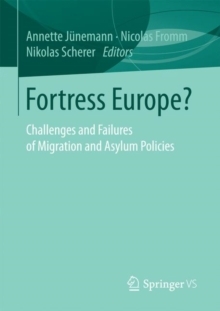 Taking migration and asylum policies as a starting point, it analyses the various dimensions underpinning migration. In doing so, it identifies why receiving countries are in many ways part of the problem. To eschew an overtly Euro-centric perspective and stimulate a debate between science and politics, it contains contributions by academics and practitioners alike from both shores of the Mediterranean. Pages: 188 pages, 6 Tables, color; 6 Illustrations, color; VII, 188 p. 6 illus. in color.